A serial killer is on the loose and two thirty year partners of the New York City police force have taken the lead in the case. The killer is taking out justice on criminals who have fallen through the cracks of the criminal system. Deeming the serial killers motives to handle what the cops and criminal system could not. The two cops soon realize that they may be dealing with a cop serial killer who is very close to each of the cases that they are investigating. Righteous Kill feels like a very good cable film. Directed by Jon Avnet (Fried Green Tomatoes) the movie has a very strong two-thirds with writting, acting and plot development, but turns sour in the predictable finale. Avent who has had some stinkers as of late, does redeem himself from his last film 88 Minutes, but overall it feels no different than watching a special two hour episode of CSI. Essentially the film feels as though it could have been so much more, with such talented actors in the leads and also a dynamic supporting cast. Russell Gewirtz who also penned Spike Lee's Inside Man does a decent job with the script, but strained to hard at leading the viewer away from the killer, when it instead seemed to make it more apparent. From the get go the film tries to lead the viewer to the killer making it overly apparent who it is, but this quickly raises questions and leads you to believe that it may be someone else. This distracted me too many times, and ultimatley my inhibitions were correct. That is not to say the writing wasn't strong throughout the film. It was good and kept you intrigued up to the finale, which ultimately took the viewer out of the film. Al Pacino and Robert De Niro are two prolific thespians whose body of work is more than impressive. Here in Righteous Kill the two do a good job, but it makes the viewer wish that they had shared screen time together before with better dialogue and a better script. Sure there is Heat and Godfather II, but in Godfather II they do not even share a scene together and in Heat, its only like a combined 10 minutes. Here in Righteous Kill the duo spend a majority of screen time together, however, knowing their potential, it only makes you want something better. The two do provide some great scenes together and play well off eachother like old chums. The supporting cast of Brian Dennehy, Carla Gugino, John Leguizamo, and Donnnie Wahlberg also provide worthy performances. Dennehy as the partners superior officer is great and Leguizamo and Wahlberg provide a decent distraction as the competing cops in the ongoing investigation of the serial killer. Gugino is De Niro's love interest, and provides some great eroticism, but overall her character becomes a disappointment by the last act of the film. 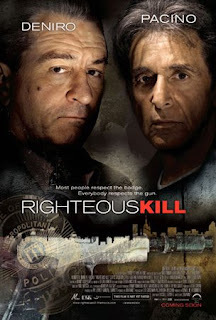 Finally Righteous Kill is a decent cop drama that has some highs and lows. The overall story and plot development is worthy effort by script writer Gewirtz, but unfortunately feels like something that should have ended up on cable. Pacino and De Niro's performances are solid, but again leave the viewer wishing this wasn't the first time the two had spent so much time together on screen. The last act of the film is very distracting and does not feel cohesive with the pacing and beat of the rest of the film, furthermore although the finale tried to have a major twist, it was as predictable as the sun rising in the morning. In closing, I liked Righteous Kill, but wanted something more from the two actors that have graced the screen for so many years.